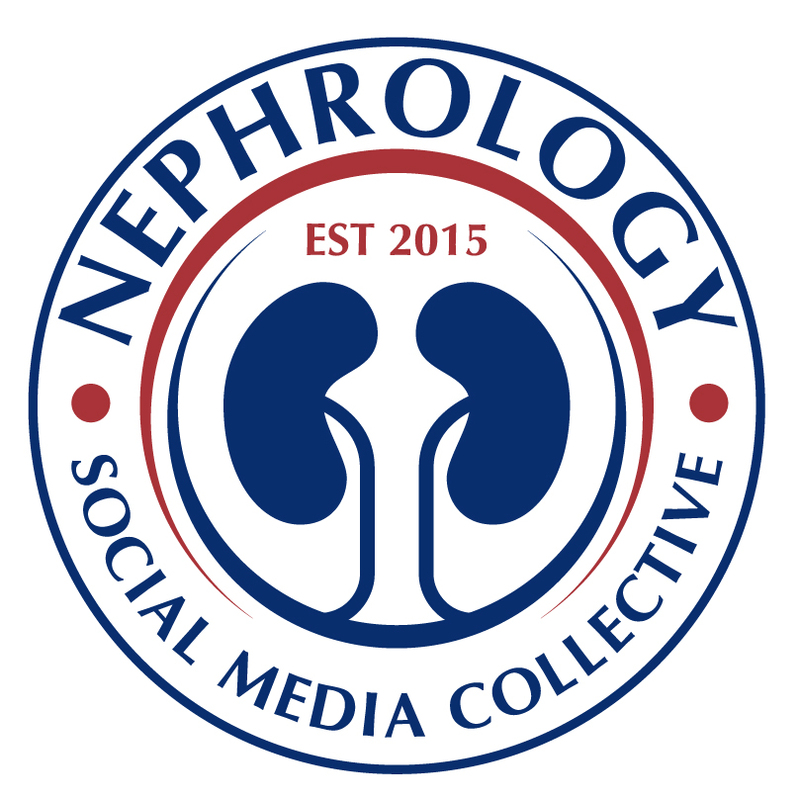 This month's eJournal club concerns a paper published by a fellow from our institution that attempts to get to the bottom of an interesting question: in patients with a high interdialytic weight gain (IDWG), is the dialysis session length (DSL) or the total volume gained more important? Both of these have been associated with increased mortality and both lead to an increased ultrafiltration rate (UFR). However, because they are interrelated, it is difficult to say which is more relevant. For this study, the authors looked at more than 14,000 patients attending dialysis in the US. They excluded patients at extremes of session lengths and those who did not gain any weight between sessions. Patients with a URR less than 65% were also excluded to rule out any effects of underdialysis. The mean IDWG and DSL over 30 days were chosen as the exposures of interest. Interestingly there was high correlation between the 30-day IDWG and DSL and the 60 and 90-day means. The outcome was death from any cause. For the purposes of the analysis, the participants were divided into 2 groups for each exposure - less than or greater than 3kg IDWG and less than or greater than 240 minutes for DSL. A matched case-control study design was used. Not surprisingly, the patients with higher IDWG tended to be younger, male, AA, had higher blood pressure and a higher prevalence of diabetes and CHF. Patients with lower DSL were more likely to be female, older and were less likely to have diabetes, CHF and CAD. For the DSL analysis, lower DSL was associated with a HR of 1.32 (1.03-1.69) for mortality after full adjustment. For the IDWG analysis, increased IDWG was associated with a HR of 1.29 (1.01-1.69) for mortality. Thus both DSL and IDWG were independently associated with mortality. What does this study mean for clinicians. It suggests that targeting both of these interventions could be useful. However it should be pointed out that this is an observational study and that they could not show that changing any of these exposures changed risk. Also, the because of the study design, the authors can only state conclusively that both are associated with mortality and not which one is more important. These conclusions may seem obvious but it is important to have good evidence to present to patients who may be frustrated with our requests to increase times and reduce fluid intake. Head over the eJournal Club to continue the discussion of this paper. The post from Veeraish earlier this week reminded me of this patient who demonstrated an important learning point regarding hypokalemia in hypothermic patients. A 75 year old woman was found unconscious in her unheated home with overnight temperatures of -1⁰C. On arrival at the Emergency Department, her core rectal temperature was a staggering 21⁰C, blood pressure 90/50 and pulse was 28 beats per minute. EKG was classic, demonstrating slow atrial fibrillation, wide T wave inversion and the characteristic J waves of hypothermia (see Figure; note that the depth of the J wave inflection correlates with the degree of hypothermia). Laboratory values included serum potassium of 1.1 mmol/L, phosphorous <1 mg/dl, pH 6.95, lactate 8.5 mmol/L, glucose 522 mg/dl. Her renal function was normal. After some initial warming, repeat potassium was 1.6 mmol/L and her heart rate improved. When she had been warmed to 26⁰C, the serum potassium corrected to 5.1 mmol/L before settling at 3.6 mmol/L (with no potassium supplementation). Her serum phosphorous level and blood sugars normalized when her body temperature rose above 30⁰C. She also spontaneously converted to sinus rhythm. This case illustrates the profound metabolic complications which can arise in the context of extreme hypothermia. Hypokalemia is well recognized in hypothermia, however, the drop in serum potassium levels is usually mild. 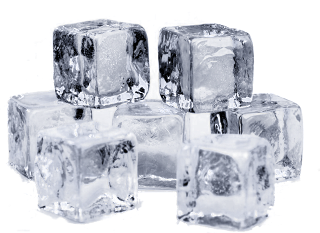 Most reported cases involve intentional body cooling in treatment of severe head injury or post-cardiac arrest. The mechanism of hypokalemia is thought to be redistribution of potassium back into the cell. As mentioned by Veeraish, a case has been bravely described of a patient developing hypothermia-associated hypokalemia while being intentionally cooled after head injury. Treatment with potassium supplementation and re-warming occurred concurrently and the patient then suffered a fatal arrhythmia. As the serum potassium will correct itself with rewarming, we should be extremely cautious about administering potassium to hypothermic patients due to the risk of severe rebound hyperkalemia. Icahn School of Medicine at Mount Sinai are organizing a CME event: "Contoversies in Kidney Disease" aimed at attending nephrologists and fellows on September 13th 2013. 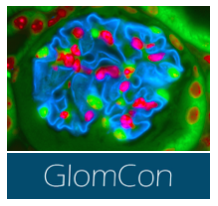 This course will cover a broad range of topics of interest to nephrologists including cardio-renal issues, vitamin D and cardiovascular disease, genomics and IgA nephropathy. They have a great group of invited speakers. In order to sweeten the deal for fellows, the registration fee will be $25 for trainees and there will be a special Renal Fellow Jeopardy Contest during lunchtime. I recently received an inpatient consultation to see a CKD 5D patient. The reason for consult, as is mostly the case with dialysis patients was that he “needs hemodialysis”. This dialysis patient wasn’t the average bear though. He had had a witnessed cardiac arrest, was treated by EMS, and defibrillated. He had a return of spontaneous circulation after being pulseless for 20 minutes. As soon as he got to the ER, he was initiated on our standard institutional therapeutic hypothermia protocol. I was called in to dialyze him because (it wasn’t his usual day) the cardiologist wanted to perform a left heart cath on him the following day, and they “did not want dialysis to interfere with that schedule”. My clinical assessment did not reveal a severe degree of volume overload. He wasn’t hyperkalemic, and had only a mild degree of lactic acidosis that was nicely compensated by him being appropriately ventilated. Due to the concerns that I talk about below, I did not see an emergent reason to dialyze him. 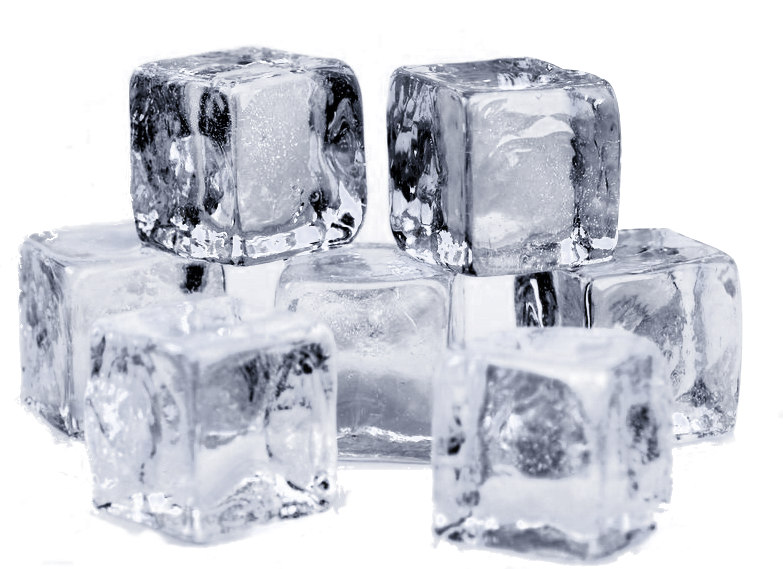 Therapeutic hypothermia entails cooling post cardiac arrest patients to 32-34 degrees Celsius, ideally within 6 hours of a cardiac arrest. Both intravascular and surface cooling methods are used. At my institution, the protocol involves administering up to 3 liters of 0.9% saline (which has been cooled to a temperature of 4 degrees Celsius), over an hour. This is complemented by cooling vests. Once target temperature is reached, the cooling phase is continued for 12-24 hours, after which the patient is rewarmed gradually at the rate of 0.5 degrees Celsius/hour. Hypothermia can cause hypokalemia via two different mechanisms. Low temperature causes a transcellular shift of potassium in to the intracellular compartment. This effect is possibly mediated by increased beta adrenergic and sympathetic activity. In fact, hypokalemia in the setting of hypothermia must be repleted extremely cautiously, if at all, given the risk of rebound hyperkalemia as potassium moves back out of the cells when the patient is rewarmed. This rebound hyperkalemia can be frequently fatal due to arrhythmias. The second mechanism by which hypothermia causes hypokalemia is by the induction of polyuria, also known as “cold diuresis”. This hypokalemia is mediated by increased urinary flow, and is seen in conjunction with hypovolemia, hypophosphatemia, and hypomagnesemia. I didn’t observe any of these in my patient, maybe because of his oligo-anuric status at baseline. Nevertheless, close monitoring of volume status and electrolytes is required. Hypothermia interferes with platelet function and with the clotting cascade. In fact, as per this review, 22% of patients had bleeding post-hypothermia induction. That might be a concern when making the decision to dialyze post-hypothermia patients with heparin. The other issue that I ran in to, that was specific to dialysis patients, was the concern about the patient’s temperature. As we know, most HD machines warm blood before returning in to the patient. With most machines, the warmer cannot actually be turned off and only goes as low as 35 degrees Celsius. In other words, dialysis can inadvertently warm the patient up to this temperature (from the target temp of 32 degrees, per the hypothermia protocol)! CRRT machines do have adjustable temp settings that goes down to 32 degrees, so that might be a safer alternative. Given the risk of inadvertently warming the patient, and because I did not see any emergent indication for dialysis, I did not dialyze the patient. I believed that in that situation, his hypothermia protocol took precedence over dialysis. 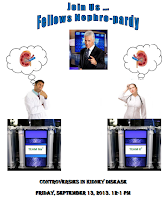 In my experience, I have observed that referring non-renal physicians often consider inpatient hemodialysis an ancillary service, akin to placing an order for an x-ray or a lab draw. Seasoned fellows have heard this phrase all too often, “I want you to come down and dialyze this patient”. You are then left with the unenviable task of explaining to the non-renal physician that the decision to dialyze would be made by the nephrologist after proper assessment of the patient (isn’t why they consulted you in the first place?). Let’s not allow our familiarity and comfort with dialysis technology lull us in to putting our guard down. Dialysis is an inherently intense and complicated procedure where multiple clinical parameters need to be closely watched. It’s a fact that is often lost in translation. This was an interesting case and all those who responded correctly identified that the patient had bowel pathology. However, only one person figured out that the issue was an ileostomy. This patient had a low urine volume and an extremely low urinary citrate and sodium. The low citrate could indicated a renal tubular acidosis except that the urinary ammonium was high and the urine pH was very low indicating preserved ability to acidify the urine. This points to a metabolic acidosis. The urine sodium in an average US resident is between 100-200 mmol/day. Outside of the amazon, it's hard to imagine that anyone could take in this little salt. This points towards loss of sodium bicarbonate and water from the GI tract. Finally, in the setting of IBD, generally it is accompanied by hyperoxaluria. There are a number of potential mechanisms for this; decreased metabolism of oxalate by oxalobacter formigenes, decreased calcium binding to oxalate because of the relatively increased binding of calcium to malabsorbed fat in the GI tract. In any case, in order to have hyperoxaluria, it is necessary to have a functioning large bowel. In this case, the patient's urinary oxalate was 28 which is in the low normal range and not suggestive of hyperoxaluria. Thus, the diagnosis is high output of alkaline fluid from an ileostomy. The treatment in this case is to increase fluids and treat with a combination of sodium and potassium citrate. Even a small rise in urine pH would significantly reduce the risk of uric acid stones while the citrate and increased volume should reduce the calcium oxalate stone risk. There has been much recent interest in novel extra-corporeal treatments for removal of nephrotoxic free light chains (FLC) in myeloma cast nephropathy. HCO dialyzers employ high flux membranes with particularly large pores (up to 50kDa Vs 15kDa for conventional high flux) facilitating the removal of large plasma proteins such as FLC (kappa and lambda light chains have molecular weights of 22kD and 45kD respectively). HCO-HD may also be potentially beneficial in rhabdomyolysis with myoglobin having a molecular weight of 17kDa. Extra-corporeal removal has primarily been achieved using plasma exchange and has long been a controversial topic in nephrology. HCO dialyzers are much more efficient at clearing FLC compared to plasma exchange. Multiple case reports have suggested a benefit to early use of HCO-HD in cases of cast nephropathy and a study by Hutchinson CA et al demonstrated an early reduction in FLC to be associated with renal recovery. Another paper from the same group reported on 67 patients with AKI due to cast nephropathy who received HCO-HD with modern chemotherapy. The majority of patients had sustained reductions in serum FLC concentrations (76%) and a high rate of independence of dialysis (63%). The HD regime used Gambro HCO 1100 dialyzers and was aggressive, with almost daily 8-hour sessions for the 12 days. After this, the schedule drops back to alternate days and finally to three 6-hour sessions per week after day 21. My limited experience with this regime in 2 patients demonstrated a need for regular phosphate and albumin repletion and careful monitoring of other electrolytes. Obviously HCO-HD will only remove FLC and will not stop their production. Therefore, for a sustained response, patients need to be a on a chemo-sensitive regime. The above studies have demonstrated that patients who need a break in chemotherapy do worse, as do those with signs of chronicity on renal biopsy. A randomized controlled trial, led by Dr. Hutchinson, in the UK is currently on-going (Eulite Trial) which will compare conventional high flux HD with HCO-HD in patients receiving chemotherapy (bortezomib or thalidomide plus dexamethasone). HCO-HD certainly appears to be more efficient than plasma exchange at reducing FLC levels but at this point, its precise role in the management of cast nephropathy is unclear. We await the Eulite trial to hopefully clarify the potential benefit of HCO dialysis in this situation. I recently saw an interesting case series published in CJASN where they reported four cases of oliguric AKI associated with synthetic cannabinoids use. 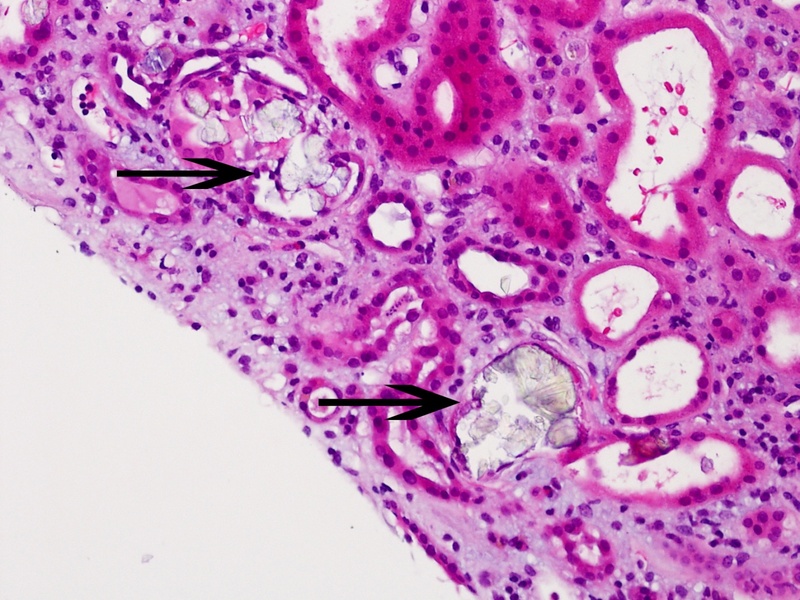 Renal biopsy revealed acute tubular injury in three of them and calcium oxalate crystals in two. Interestingly, around the same period of time I was rotating in nephrology consult service and had an elderly patient with history of paraplegia and neurogenic bladder (on intermittent self-catheterization), who was brought to the ER with altered mental status for which he was intubated for airway protection. On presentation, he was found to have acute kidney injury (Cr 6.0). 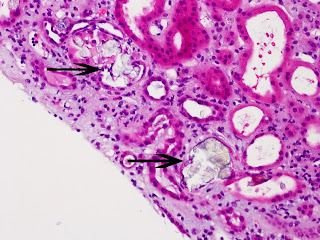 His renal function continued to deteriorate with no specific etiology for his renal failure, so he had a renal biopsy which showed evidence of an active tubulointerstitial nephritis with marked tubular injury and calcium oxalate crystals present within the tubular lumina. Remarkable findings in his history included the recent use of cannabinoids. He never had history of renal stones. His home medication includes: methadone, oxycodone, nortriptyline and pregabalin. Admission labs showed normal osmolar gap and negative toxicology analysis. Urine microscopy showed muddy brown casts with no identifiable crystals. Abdominal ultrasound did not reveal any renal calculi. Renal replacement therapy was started for uremic symptoms and he continued to require replacement therapy after his discharge. Synthetic cannabinoids use should be in our differential diagnosis for unexplained AKI in young adult population as it can cause either ATN or AIN or both. A high index of suspicion is required as they may not be detected on routine urine drug screens. 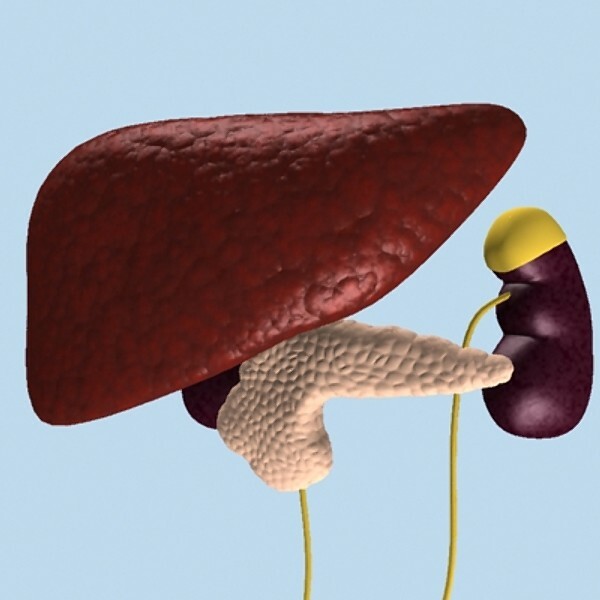 When should a Liver Transplant Recipient get a Combined Liver Kidney Transplant? Currently there is huge variation in the number patients receiving a kidney transplant at the time of their liver transplant across the US; Combined Liver Kidney Transplant (CLK). The rate of good quality (standard criteria) kidneys being transplanted at the time of liver transplant varies from about 20% in the Midwest to about 6% in centers on the east coast, for example. The reasons for this disparity are varied and there is a real worry that many Liver transplant patients are receiving a kidney when one is not really needed. This reduces the number of good kidneys in the kidney alone pool. In 2012 liver-kidney transplants were the highest of all combined liver transplantations in the US. Liver wait list patients are frequently very sick and renal dysfunction is common in this population of patients. Elevated creatinine can significantly raise the MELD score placing candidates towards the top of the liver wait list. There is a survival advantage of CLK vs Liver Transplant alone (LTA). This puts pressure on physicians and surgeons to consider transplanting a kidney with the liver. There may also be financial and statistical reasons for a center to transplant a kidney with a liver. The outcome data favoring CLK over LTA in renal failure patients is all retrospective, non-randomized and does not take into account the cause of peri-transplant renal failure and whether the patient truly had established ESRD or CKD4 at the time of transplant. Another factor putting pressure on medical professionals to perform CLK transplants is the fear of ‘getting it wrong’. Survival is very poor in patients who do not recover renal function after LTA vs those who do. Currently a patient put onto the kidney alone list after LTA will have to wait the average 5 years for their kidney (average kidney alone wait list time in SE USA). Given the poor outcomes described by Northrup, these patients are likely to die with a functioning liver waiting for a kidney. So can we predict who who will develop ESRD after LTA? A number of studies have looked at this using various prediction parameters. - Patients with eGFR consistently less than 30ml/min/1.73m2 (MDRD) for 90days prior to LTA had an increased risk of ESRD. 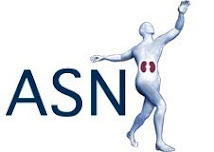 - ATN vs HRS as a cause of renal failure at time of LTA increases the risk of post LTA CKD 4/5. So how can we improve the allocation of kidneys in CLK patients? - Create a system that is not easily manipulated. 1) The patient receives a time credit of the 25th percentile of waiting time for the center they are listed in. 2) In addition, the patient receives credit for the time spent from transplant of the primary organ (time of arterial anastomosis to time of listing). This time credit should encourage doctors to allow time for the kidney to recover but not discourage living donation. The duration and time of CKD first documentation needs to be assessed. This is an interesting and difficult area for the transplant physician. I certainly agree that clearer guidelines are needed to ensure our limited pool of good kidneys is used wisely and no ‘game playing’ occurs. 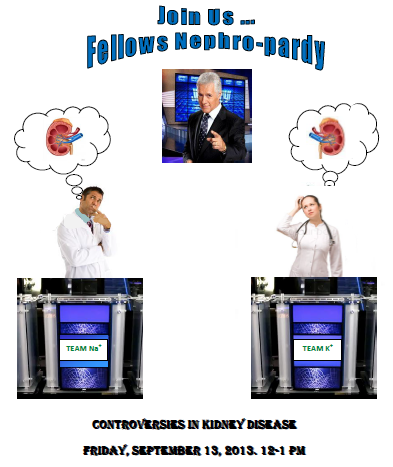 With regard to Dr Berg’s proposals; the AKI and CKD criteria are most troublesome. We all know kidneys can recover function weeks after an AKI event. Clinical diagnosis of AKI or even diagnosing CKD in these patients in difficult and requires great clinical skill from the nephrologist. Performing a kidney biopsy to gauge likelihood of recovery and cause of AKI sounds attractive but is risky and costly in this patient group. Kidney Stones - What's the diagnosis? What is the underlying diagnosis (an important piece has been left out of his background history)? What is the best approach to treating his kidney stones? Answers in the comments please (if this proves popular we may make it a regular feature).